DELRAY BEACH, Fla. - All it takes is a swipe, and the information from your credit card’s magnetic stripe could be on its way to the "dark net." Thieves plant skimming devices at gas stations and ATMs to steal your card info, but according to Delray Beach Police Detective Kimberly Mead, that is only half the battle scammers face. Next, they need to find a card with a magnetic stripe to hold the information. 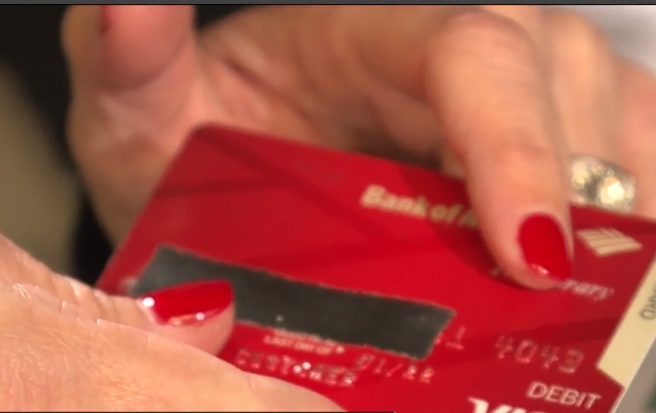 "Anything that has a magnetic stripe on the back can be turned into a credit card,” Mead told WPTV. “Hotel keys, gift cards, gas station cards, anything that has a magnetic stripe." This includes lost, stolen and seemingly useless cards thrown away in the trash. Recently, Mead busted a Florida man for reprogramming credit cards with stolen information. “We see this quite frequently,” Mead said. In her most recent case, Mead says she was tipped off when the credit card number on the receipt didn't match the numbers written on the front of the card. Then, using the same type of card reader thieves use to re-encode magnetic stripes, Mead checked the internal data on the man’s credit cards. “When we swiped the magnetic stripe, the number that showed up on the screen did not match the number that was embossed on the front [of the cards],” she said. Actively monitor your charges through online and mobile banking apps, and think twice before tossing any card with a magnetic stripe. Anyone can purchase a credit card reader. Mead says it is not illegal to possess them, but it is illegal to use them to re-encode cards.